In a world overrun by sissy crossovers, the classic Jeep Wrangler is tough-as-nails, and the off-road expert you've come to rely on. Four-wheel drive is standard, as are a 285-hp 3.6-liter V-6 and a six-speed manual; a five-speed automatic is optional. What isn't optional is the need for a vinyl graphic to set you apart from the Jeep crowd! 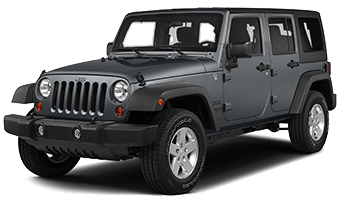 Below you'll find a wide variety of Jeep Wrangler vinyl graphics, Wrangler stripes, and Wrangler decals for the model years indicated. Featured you will find the RUNDOWN Jeep Wrangler Hood to Fender Vinyl Graphics and Stripes Kit, the OUTFITTER Jeep Wrangler Hood Vinyl Graphics and Stripes Kit, the TREK : Jeep Wrangler Fender to Fender Vinyl Graphics and Stripes Kit, the MONSOON Universal Style Vinyl Graphics Kit, the Jeep Wrangler : Army Door Vinyl Graphic Stripe Kit Vinyl Graphics, Striping, and Decals by Custom Auto Designs, the Jeep Wrangler : Center Army Hood Vinyl Graphic Stripe Kit, the Jeep Wrangler : Rustic Army Hood Vinyl Graphic Stripe Kit Vinyl Graphics, Striping, and Decals by Custom Auto Designs, and so much more! Choose one of these popular vinyl decal graphic styles today!